3D Equipment and Piping Modeler with automatic Piping Isometric and 2D Plan extraction. Automatic Material Requisition generation. 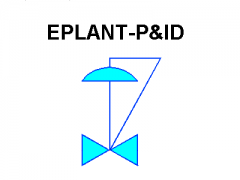 EPLANT-P&ID has a predefined graphic symbol library (ISA standard), easily modifiable by the user. The user can specify which information is automatically copied from the drawing files to the data base module and modify all report formats. Each object type (Equipment, Control Valves, Relief Valves, etc.) can have a different data structure.